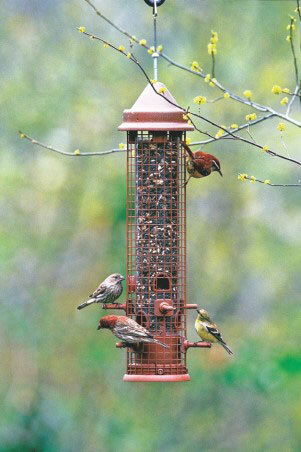 We get a lot of questions about the feeders, so here is the full scoop. The feeders are located in the front garden of the historic log cabin. They are hanging from metal crooks on an Advanced Pole System with a squirrel guard halfway up the pole. A description of each feeder from left to right is shown below. Seed cylinders are seed shaped into a cylinder held together with gelatin. They are easy to fill. They typically last longer than loose seed. Most seed-eating birds will eat seed cylinders. Cage comes down around the tube in the middle shutting off feeding ports. Keeps squirrels from eating seed. It needs 18” of space around it to be completely effective. Most seed-eating birds will eat from it. It can help control White-winged Doves. 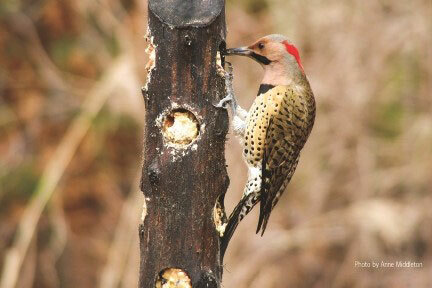 The paddle at the bottom is designed to give woodpeckers a place to put their tail to keep their body upright. Made out of recycled plastic bottles which will make it last longer than wood. 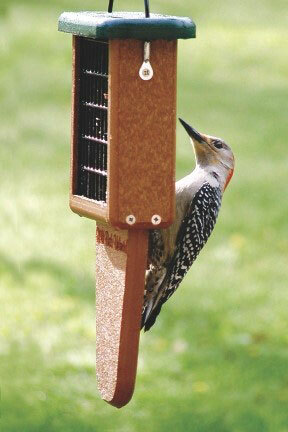 Insect-eating birds such as woodpeckers, warblers and mockingbirds will eat suet. Made for clinging birds such as woodpeckers. 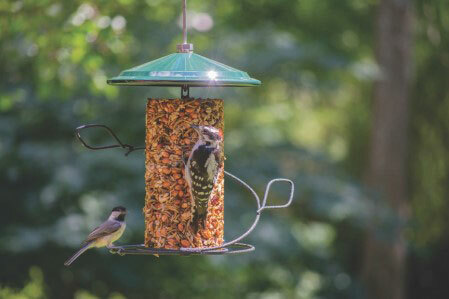 Suet is high in proteins and fat which help birds grow healthy feathers. Insect-eating birds such as warblers like it, especially in winter when insects can be scarce. 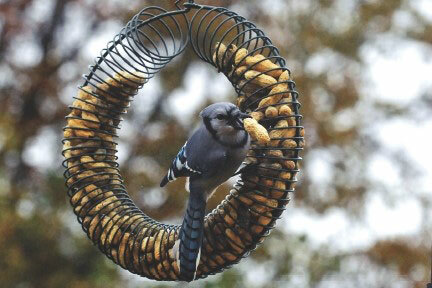 Blue Jays, Red-bellied Woodpeckers and Tufted Titmouse like in-shell peanuts. 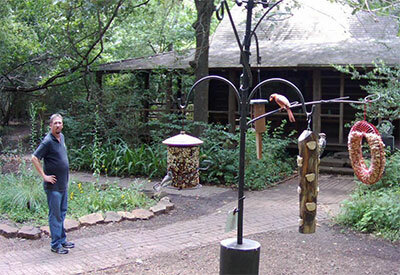 These feeders, along with ones in the back garden of the log cabin, are generously provided and re-stocked by Paul Fagala, owner of the Wild Birds Unlimited store at 14032 Memorial Drive near the Sanctuary.